Arrival Day: Our packages include airport transfer services hence we will meet you and drive from Kilimanjaro International Airport (JRO) to your hotel in Moshi and rest for a while. Afterward, you will meet your guide for gear checking and briefing about the mountain. Also, your guide will go through your group camping gear and demonstrate the use and operation of all equipment, especially emergency oxygen cylinder and pulse ox meter and explain signs and symptoms of various mountain sicknesses which might happen while trekking. The drive from Moshi to the Mount Kilimanjaro National Park Gate takes about 50 minutes. The journey passes through the village of Machame which is located on the lower slopes of the mountain. You leave the park gate and walk through the rain forest on a winding trail up a ridge. Lower down, the trail can be muddy and slippery. Gaiters and trekking poles are a good idea here. You will continue a short distance until you reach the Machame Camp. After breakfast, you will leave the glades of the rain forest and continue on an ascending path, crossing the little valley walking along a steep rocky ridge, covered with heather until the ridge ends. The route now turns west onto a river gorge. Time for rest, dinner, and overnight at the Shira campsite. From the Shira Plateau, you will continue to the east up a ridge, passing the junction towards the peak of Kibo. As you continue, your direction changes to the South East towards the Lava Tower (4600m), called the “Shark’s Tooth.” Shortly after the tower, you will enjoy your lunch and break for acclimatization. You will continue down to the Barranco Hut at an altitude of 3940m. Here you will rest, enjoy dinner, and overnight. Although you end the day at the almost same elevation as when you started, this day is very important for acclimatization and will help your body prepare for summit day. At Stella Point (5756m), you will stop for a short rest and will be rewarded with the most magnificent sunrise you are ever likely to see (weather permitting). From Stella Point, you may encounter snow all the way on your one-hour ascent to the summit. At Uhuru Peak (5895m), you have reached the highest point on Mount Kilimanjaro and the continent of Africa. Faster hikers will see the sunrise from the summit. 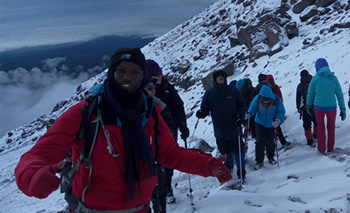 From the summit, you will now make your descent continuing straight down to the Mweka Hut camp site, stopping at Barafu for brunch. You will want gaiters and trekking poles for the loose gravel going down. Mweka Camp is situated in the upper forest and mist or rain can be expected in the late afternoon. Later in the evening, you will enjoy your last dinner on the mountain and a well-earned sleep. Departures Day: Our packages include departure day services. Enjoy breakfast and a morning sightseeing in the city or join us for Safaris. If you are returning home our driver will bring you to Kilimanjaro International Airport (JRO) to catch your flight home.